If you try to read it too closely, the structure of this book will drive you crazy. Ask me how I know. On the first level, it seems to emanate from the addled mind of a navel-gazing Irish university student stumbling around thinking about writing a book or a school paper. As I said, you can go nuts trying to follow it. 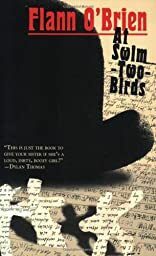 Yet At Swim-Two-Birds is a modernist masterpiece, the best-known fictional work of Irish newspaper writer Flann O'Brien. Published in 1939, the book's great charm is O'Brien's constant reinvention of the English language, fueled and altered by an Irish sensibility and language; the sentences come out in a torrent of musical, drunken ramblings.